The pumpkin is a quintessential symbol of the fall season. Favored by many families as a fall decoration, pumpkins can be used for a wide variety of projects, one of the most popular being jack-o-lanterns. Pumpkins can also be displayed on their own, often placed on doorsteps and other areas for decoration. While they can be displayed in many different ways, using one for the basis of a centerpiece is an inexpensive and effective way to decorate your home for fall. 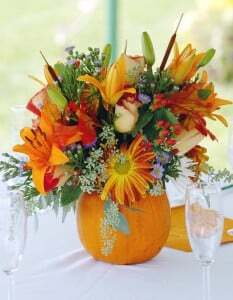 Complete the following steps to create a floral arrangement using a pumpkin as a festive container. Spread out old newspaper where you’ll be creating the centerpiece. This will keep any mess made from carving the pumpkin off the floor. Set the pumpkin on top of the newspaper with the stem up, and carefully carve out the top in a circular pattern using the knife. Scoop out the pulp and seeds from inside the pumpkin using the spoon, placing them in a bowl or on the newspaper. Ensure that all of the pulp and seeds have been removed, and set the pumpkin aside for two hours to dry. Allowing the pumpkin to dry will increase its longevity and help prevent mold from forming. Cut the floral foam to fit inside of the pumpkin, and place it in a water-filled container greater than the height of the foam, such as a sink or a large bowl of water. Allow it to absorb the water on its own by letting it gradually sink into the container. Remove it from the water once completely soaked, and place it in the hollowed-out pumpkin. Soaking the floral foam will supply the flowers with water. Stick the cut fall flowers in the floral foam so that they come out of the top. Continue to do so until the flowers cover most of the hole at the top, hiding the inside of the pumpkin and the floral foam. – A potted arrangement of flowers can be used as an alternative to floral foam by placing the pot inside of the pumpkin where the floral foam would be. – Fall leaves, seedpods and berries can also be used in the arrangement. – Separate the seeds from the scooped pulp to make a healthy, roasted treat. Preheat the oven to 325◦ F. Clean the seeds with water, lay them out on an oiled baking sheet, and sprinkle with salt. Place the seeds in the oven, and bake for about 25 minutes or until toasted, stirring ten minutes into the roasting process.